Do you have a minute to spare to learn some English? 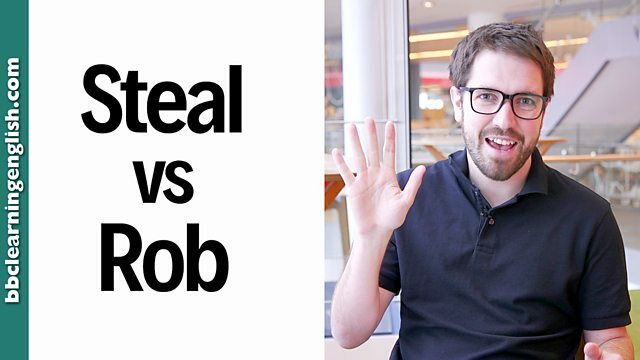 Let Tom divulge the difference between steal and rob! Give us 60 seconds and we'll give you the English! Hi everybody! Tom here from BBC Learning English. Today I'm going to explain the difference between to steal to rob. Both to steal and to rob mean 'to take something without permission'. To steal focuses on the object or the thing which is taken. For example: Hey! Somebody just stole my phone. Rob focuses on the victim of the crime. For example: The men robbed a bank last night. I wouldn't say: Someone robbed my phone. I would say: They robbed me and stole my phone. Both steal and rob mean 'take something without permission'. Steal focuses on the object or the thing which is taken. Hey! Somebody just stole my phone. You once stole chocolate from a shop! She has completely stolen my heart. Rob focuses on the victim of the crime. The men robbed a bank last night. Three guys robbed me while I was travelling home. She has been robbed three times this year. What happens when something gets stolen or someone gets robbed? True or false: Both steal and rob mean take something without permission. Does this sentence mention what was stolen or the victim? She was ______ as she left the station.